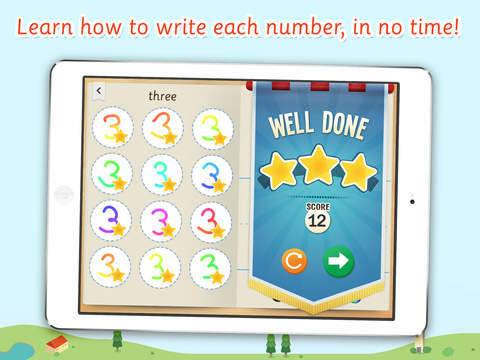 This app supports children in learning how to write the numbers 1 to 20. It shows how to correctly write the numbers and analyses children's own attempts to provide them with useful practice and feedback. Writing clear and correct numbers is one of the first steps that a child takes in their early numeracy education. This app takes children through each number, providing them with excellent feedback and assistance. The player learns to write each number in turn. At first, they are guided through writing the number and gradually the support is removed and the number needs to be written without following a guide. Each successful attempt adds to the score. If you use this app after trying others that claim to show how to write numbers, you will see how much more refined this one is. More often than not, apps just have a few waypoints in each number that have to be joined together. All manner of deviations from the correct form can be made between these points. Not so in Number Workbook. It allows some deviation to take into account the natural variance in handwriting, but for a number to be judged as correct, it has to be recognisably so. It is a feature that is easy to overlook but considerably lifts the quality of this app over those that may look similar. The numbers extend up to twenty. When it reaches double digits, a small glitch occasionally appears in the display of the first number. If it is written correctly, it is marked as such but part of the number is not shown. This is a rarely occurring problem but could result in confusion in an otherwise robust app. A refreshing diversion from just writing numbers punctuates the activities every so often. In these, the player answers simple counting questions. They do this by writing the number as they have already learnt to do. This is great as it strengthens the mental link between the written number and the value it represents. Children will also be taking their first steps in writing, rather than saying, a number as an answer to a maths question. Stepping through the numbers, combined with the intermissions, provides a good pace to the progress through the app. The skills built remain consistent but are stretched by advancing through to higher numbers. The app's polish is evident in its presentation. Attractive graphics in a style that children will find welcoming makes each task clear. 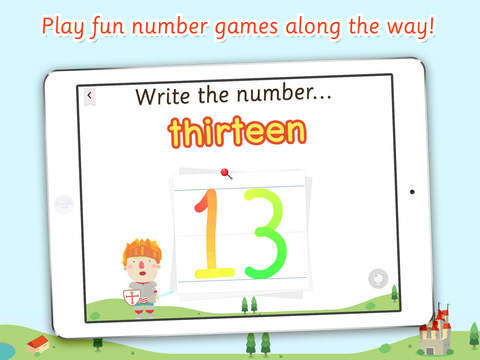 The rainbow ink or selectable colours that numbers are written with add to the child-friendly nature of the app. Instructions and feedback are given to children in spoken form. The clear, British-accented speaker provides both support and encouragement to the user of the app and lets children with limited reading skills develop their learning independently. 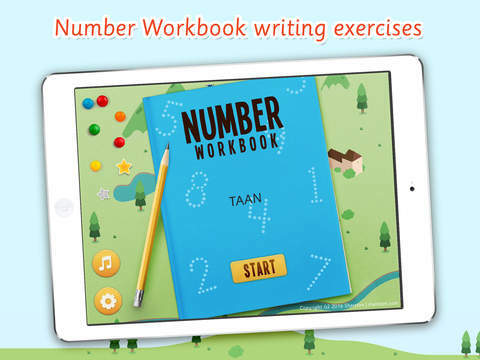 Number Workbook would be easy to make use of in a classroom. The music is easily toggled off from the settings. The app supports multiple users and they can choose whether the user is right or left-handed. This, in itself, is a thoughtful and useful feature, changing, as it does, the app layout to be most suitable for the user's favoured hand. Teachers have access to quarterly usage reporting from the developer, so that they can monitor their children's engagement and usage within the app. For the app to update this data, it does need access to a Wi-Fi connection at some point, but it is quite usable without one from the player's point of view. This is an app that may appear, on the surface, to cover the same ground as other apps. Rest assured, however, that Number Workbook's execution and careful design lift it way above the others. Using this Kizzu app from Sherston with children is great to help them develop their numeracy skills in a fun and engaging way. Children set out on their quest to the castle, choosing which type of knight they want to be and if they're left or right handed before they go. Starting at zero, they need to complete the number exercises and games to win armour and other objects which will help them along the way. 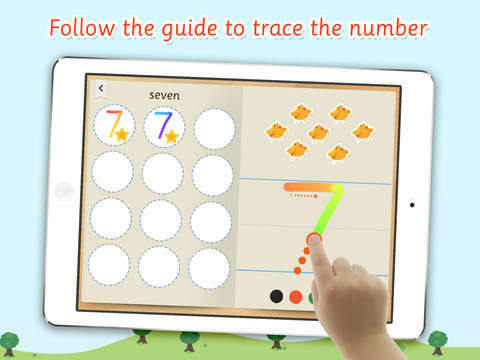 Within each number exercise, an interactive tracing guide teaches the child how to create the shape of the number with their finger. Once they have practised with the guide, a clear audio instruction asks them to try writing the number without it. This helps them to develop the confidence they need to form numbers on their own, step-by-step. When a number is completed, the child is rewarded with a special star and positive encouragement to let them know they've done a great job. The exercises can be repeated as many times as the child likes so that they are able to write and recognise numbers in no time! After a few numbers, children are given a fun game to play which helps reinforce how to write the number without the guide, as well as the number’s place in a sequence. The games include 'Count the number', 'Write the missing number' and 'Write the number'. Children also win a new part of their Knight's outfit after each stage, which helps encourage them to finish all the exercises in order to reach the castle. · Physical development - Moving and handling.